Discover benefits of vitamin E! Vitamin E is an essential nutrient with powerful antioxidants! Your body can't produce it. Your body needs it to allow proper functioning of muscles and nerves. Incorporate it into your daily life, but there are cautions to heed. Get vitamin E facts! There are eight forms of vitamin E. Most common forms include y-tocopherol and a-tocopherol, associated with the North American diet. Rich vitamin E foods include: nuts, seeds, leafy vegetables or vegetable oils. 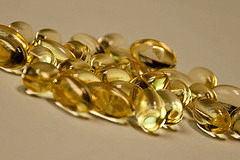 Vitamin E is found in supplements, capsule or liquid forms. Vitamin E is used in many commercial and homemade skin care products. It prevents and protects skin against free radical damage, sunburns and more! Almonds are one of the most nutritious nuts. They have 35% of the daily recommended allowance of vitamin E. They're low in saturated fat, have calcium, magnesium and other good nutrients. They contain more magnesium than oatmeal or spinach! They have antioxidants and are one of the best vitamin E foods. Sunflower seeds are an excellent source of vitamin E. Just a one ounce serving provides 76% of the recommended dietary allowance for vitamin E. It's a good source of plant protein. Protect against heart and cell damage. Repair skin tissue. Watercress is a leafy green vegetable. It has more vitamin C than an orange, more calcium than milk and more iron than spinach. It contains high content of vitamins A, B and E. It's known as the "cancer fighter", because it resists cell damage caused by free radicals. It's highly perishable so it does not last long, even when refrigerated. Store in plastic bag, refrigerate and keep up to four days. Discard any leaves that are bruised or yellow. Vegetable Oils with corn, almond or olive contain vitamin E. They can be in liquid or spray forms. Instead of adding butter to your skillet add vegetable oil, instead. CAUTION! Vegetable oils can be compromised and lead to rancidity. Rancid oils have sharp, bitter, unpleasant aromas. Store oils out of direct sunlight in a dark, dry, location. Keep bottle caps secure, since oxygen is its enemy. Amber glass bottles are ideal for storage. Goat Milk and Cow Milk contain small amounts of natural vitamin E, approx. 1% of the RDA. Vitamin E supplements come in liquid or capsule form. The American Heart Association recommends obtaining antioxidants, including vitamin E, by eating a balanced diet instead of taking supplements. CAUTION! Vitamin E supplements can react with other medications. An overdose can be toxic! Contact your health care provider, if needed. Vitamin E deficiency is rare. It is likely to occur in those who cannot absorb dietary fat, in very low birth weight infants or in those with a rare fat metabolism disorder. It can cause poor nerve conduction leading to neurological problems. It can cause anemia, due to red blood cell oxidation damage. Those with vitamin E deficiency should consult their primary health care provider for the best medical advice. -- Regulate vitamin A in body. -- Has antioxidants - prevents free radical cell damage. -- Aids in preventing: prostate cancer, breast cancer, blood clots. NOTE: Even with the benefits of vitamin E, some people have allergies or hypersensitivity to topical products. Contact dermatitis, hives, rashes, itching, inflammation or eczema are all reported using topical preparations. Discontinue use. Contact your health care provider, if needed. Consumer Reports says, the FDA recommends using water-resistant sunscreen of SPF 30, re-applying every 2 hours after swimming or sweating and using a "broad-spectrum" sunblock protecting against UVA and UVB rays. Goat milk soap is a natural moisturizer! Handmade experts confirm that this homemade soap is a miraculous luxury item! It helps improve poor skin conditions! Goat milk has natural benefits of vitamins A, B, C, D, E and K! Goat milk helps regenerate collagen under the skin, negating the visible signs of aging. Get natural vitamin E benefits and more!